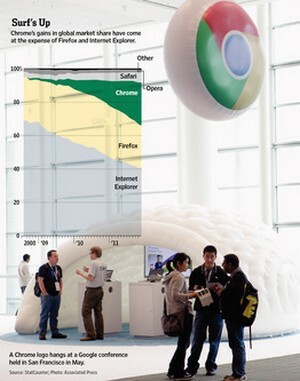 Google Chrome is one of the rapidly growing browsers after Microsoft’s Microsoft Internet Explorer and Mozilla Firefox. StatCounter reports recently that Google’s Chrome has become the second most popular browser after beating Firefox. The reports have been published in Wall Street Journal stating that the worldwide market share of Chrome has reached 25.69% just over Firefox’s 25.23%. However, Internet Explorer continues to enjoy the top spot with 40.63% market shares. However, in the United States, the Chrome is still at third spot with 17.3% of market shares, up 6.41% from the last year. Internet Explorer continues to enjoy the top position with 50.66% of market share, up by 0.42%. With 20.09%, Firefox holds the second place. Although, the Microsoft’s Internet Explorer is on the top of all browsers, it is absence from the smartphone and tablet market is a big challenge for it to retain its position. The Internet Explorer’s market shares fell below 50% for the first time, reported netmarketshare.com last month. On the other hand, Apple’s Safari – a default browser on the iPhone and iPad accounted for 62.1% of mobile traffic. Similarly, Internet Explorer being top desktop browser accounted for 52.63% of desktop traffic, the researcher claimed. There are reports that Google is working hard to bring Chrome to its Android platform in a little while as default browser. The Chrome was launched three years ago and since then its popularity is growing quickly. According to reports, the number of Chrome users reached a milestone of 200 million last month. It is a good sign that browsers are having a healthy competition and the benefits of this is already reaching users in the form of new features and improved functionality of different browsers.